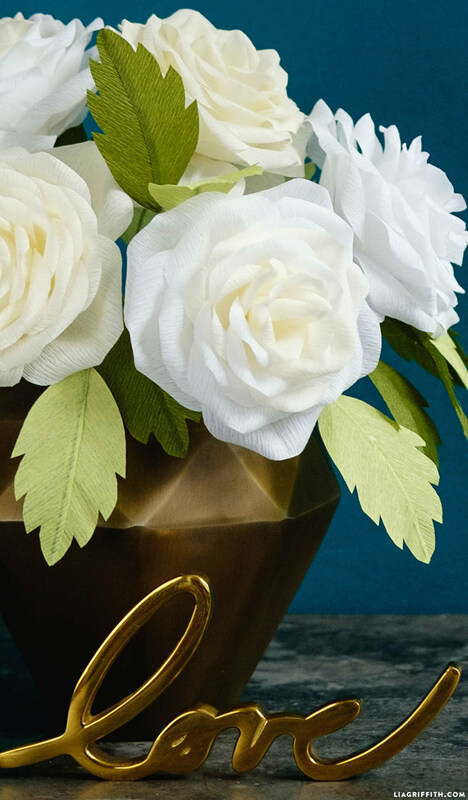 As you have probably noticed, ever since releasing our extra fine crepe paper line I have been working on a ton of new crepe paper flower designs. So far I have shared the Juliet roses, Icelandic poppies and crepe paper peonies. 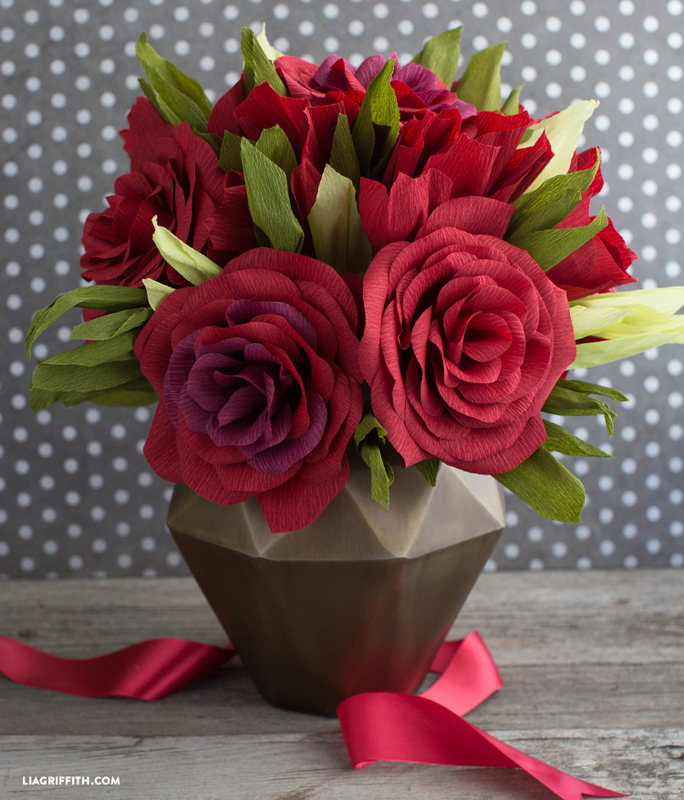 Today I am very excited to share my newest design for gorgeous blooming crepe paper garden roses. This was a design that I was just fiddling around with one night and the bloom completely came to life. With this garden rose, I wanted to create some depth in the blooms by also adding a little variation in crepe color as I built them out. Let’s get started! 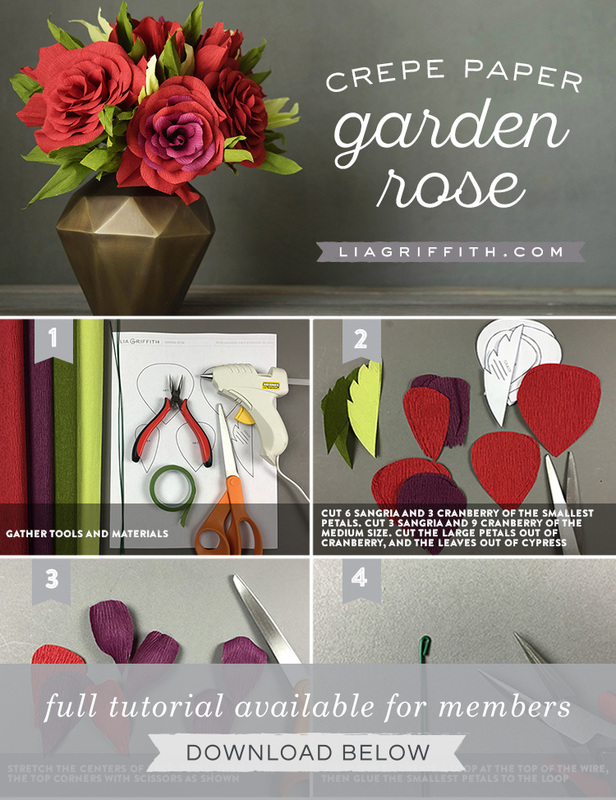 Garden roses are beautiful because they can be made is any color. 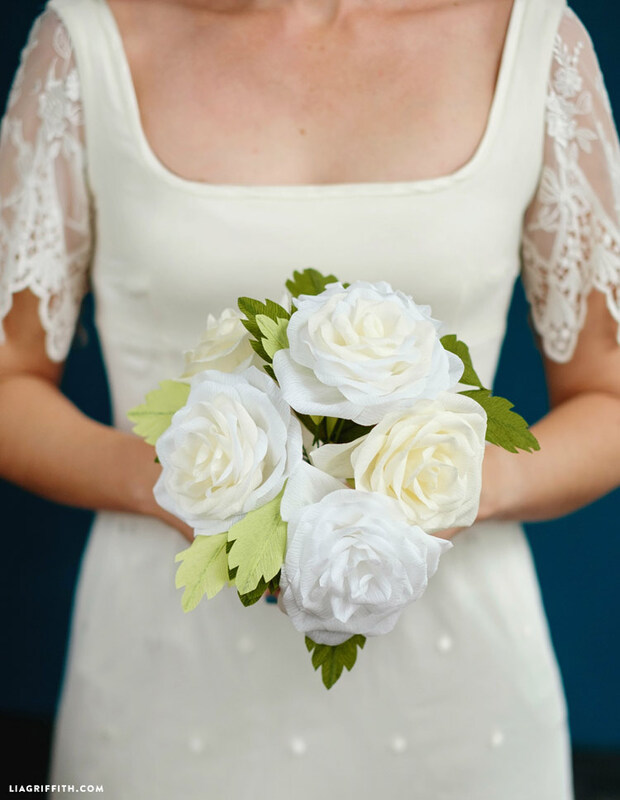 For these photos I made a bouquet of white crepe paper garden roses and a bouquet of red blooms, but they would also look gorgeous in Honeysuckle, Coral and Blush. 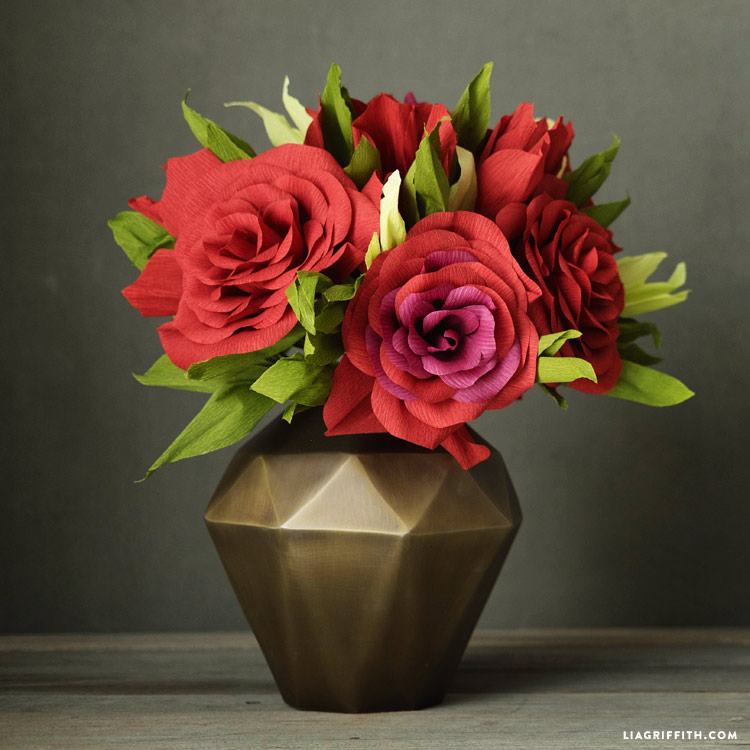 If you want to make these ombre versions, choose Vanilla and White for the lighter roses or Cranberry and Sangria for the darker bouquet. We also used a mix of Cypress and Green Tea for the leaves, but it would also be worth playing around with some of the double sided green crepe. And don’t forget the floral tape! Once you have your materials ready, print the PDF template below. Cut the template pieces and use them as a guide for cutting your crepe. As always, cut the crepe with the grain, as indicated in the template. Next, follow the step-by-step photo tutorial below or download the printable instructions. 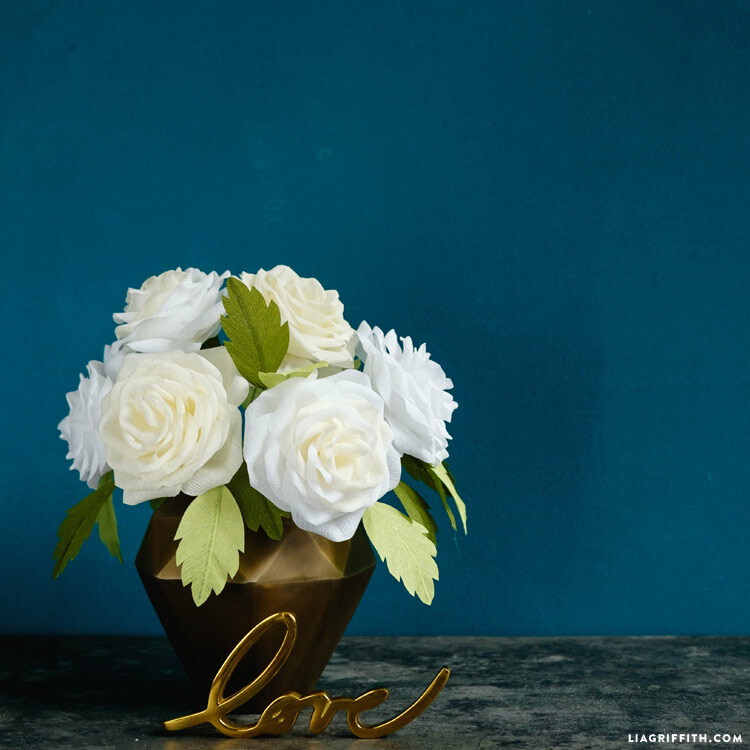 These flowers are beautiful for home decor or wedding decor. 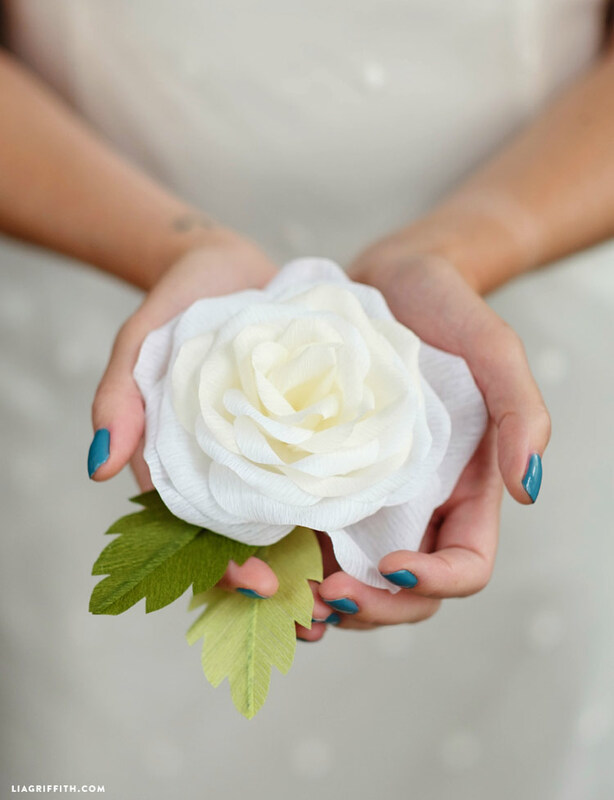 A bouquet of white crepe paper garden roses can easily work as a stunning bridal bouquet. 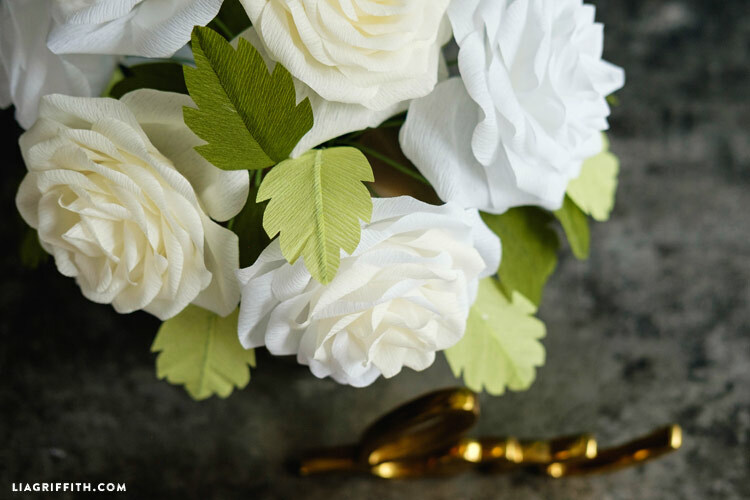 If you want to learn more about crepe paper as a crafting material, be sure to watch my free Crepe Paper 101 video as a part of my Craft School. Hi Lia! Do you Happen to have a video of you gluing the leaves together? Yours look absolutely perfect and I am struggling with mine! I think it is a technique thing that I need to get down. Thank you very much, that wa a helpful! These roses look gorgeous. Can they be made of regular crêpe paper? I live in the Netherlands and I don’t know if I can find this special crêpe paper. Once again, you’re hit it out of the park. If you would like to check out my morning glories, there are some in one of the arrangements that I did for the fair–it’s on my FB page on Susan Bonn Designs. I didn’t realize that I hadn’t posted it before, so I just did. Keep them coming–every new idea is better than the last. I’m lovin’ it!!! It would be cool if you would release a morning glory or iris template. Those are two of my dad’s favorites. Maybe in the future. Hmm… Be sure to select “Remember Me” once you sign in, and you should have the option to save your password in the web browser. Hopefully that does the trick for you! 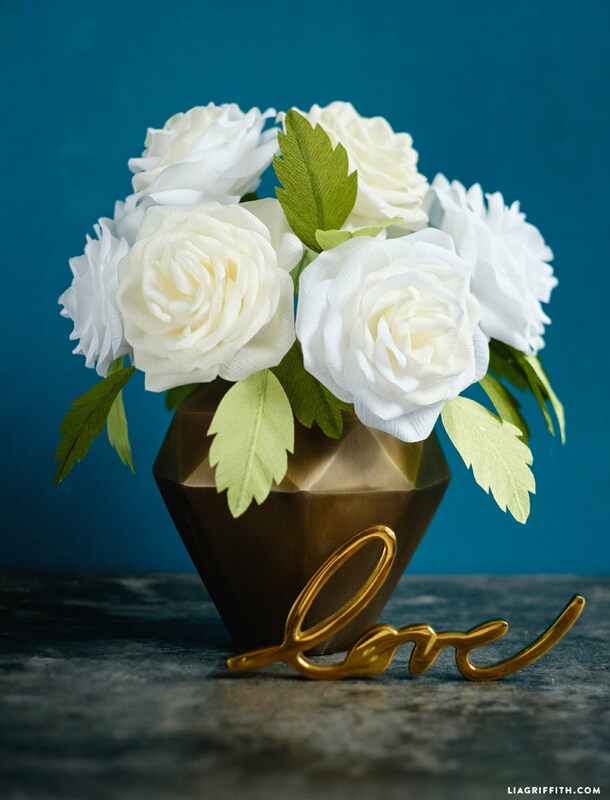 How much crepe paper would I need to make 15 of the white/off white rises wirh the leaves in the vases? You can make about 3 roses per roll of crepe.